In 2010, I was hired to do the colors for the children's book Little Laura and the Birthday Surprise. I was approached by my friend Debbie Huey (creator of Bumperboy), to help bring the book to life. She provided the line art and I did the rest. 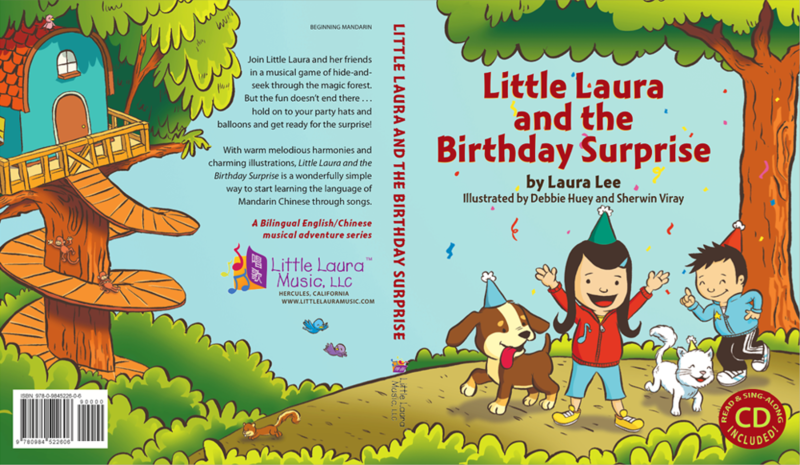 Filled with beautiful full-color illustrations and charming characters, this storybook and CD will have you counting to ten in Mandarin Chinese while singing and reading along with Little Laura and friends in the magic forest. The character of Little Laura was created by Laura Lee who wrote the book and composed all of the songs. In addition, the book is a 2011 Dr. Toy Award Winner! To supplement the storybook and cd, Laura also produced a standalone cd that had 9 original songs in bilingual English/Mandarin Chinese titled "Rainbow". I created the cd album cover art, this time from start to finish. All art by me. Left half is the back cover and the right is the front. Laura added the text and logos later.